A true bohemian is one who lives outside of the mainstream of society, often embracing an unconventional lifestyle of self-expression, creativity, and rebellion against the main rules of society. Bourgeois people tend to be from the upper middle class and are typically conservative, traditional, and materialistic. An idea or hope is described as chimerical if it is unrealistic, imaginary, or unlikely to be fulfilled. A conventional way of thinking or behaving is the one that is most commonly accepted by social groups. When one’s behavior deviates from the norm, one acts differently than other people; when one deviates from a given course, one goes in a different direction. Dissension is a disagreement or conflict of opinion amongst a group of people. Divergent opinions differ from each other; divergent paths move apart from one another. A heretic is someone who does or believes things that oppose commonly or generally accepted beliefs. An iconoclast is someone who often attacks beliefs, ideas, or customs that are generally accepted by society. A nonconformist is unwilling to believe in the same things other people do, or act in a fashion that society sets as a standard. Something that is proverbial is very well-known or famous, or is known for its wisdom. A radical solution to a problem goes to the heart or root of it, and can often seem extreme in nature. The word reactionary refers to a person who is unwilling to change and is opposed to progress, especially politically and socially. If you are staid you are set in your ways; that is, you are settled, serious, law abiding, sober, and perhaps even a tad dull because of it. A stereotype is a customary way of thinking about a particular group of people which is narrow-minded and often faulty. An unorthodox opinion is unusual, not customary, and goes against established ways of thinking. If you act in a wayward fashion you are very headstrong, independent, disobedient, unpredictable, and practically unmanageable. John is a maverick scientist who does things his own way because he hates to follow the crowd. The scientific community rejected him at first, feeling that such a maverick or independent individual has no place in a field that so heavily depends on sharing information and following specific scientific guidelines. John, however, has made some important discoveries while experimenting in his rather maverick or unusual ways, and because of that other scientists are willing to listen despite the fact that they do not agree with his approach to scientific research. Quiz: Try again! How might one describe a maverick? He is highly interested in the sciences. He would never cross mass opinion. She is strong-willed and does things her own way. A maverick individual does not follow general opinions but rather thinks for herself or strikes out on her own. Mauve Rick Rick's a maverick--you can tell just by looking at his mauve facial make-up! 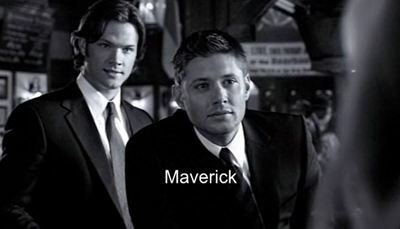 The word maverick comes from the name of a Texas lawyer. Samuel Augustus “Maverick” once owned a very large cattle ranch, sold it, and declared that any of the cattle that weren’t branded would stay with the ranch; none of them, unfortunately, had been branded, and so he lost all of them … and so none were “Maverick’s.” Hence, a maverick is one who is not part of a herd, or holds himself apart from people in general. Supernatural A maverick, if he really is one, certainly would not play by the rules.